Drawing on a lifetime’s experience as an anthropologist, David F. Lancy takes us on a journey across the globe to show how children are raised differently in different cultures. This is not a parenting book. Raising Children is a book that takes an anthropological approach to the customs of various child rearing practices in different parts of the world. In each chapter, there is a series of essays that takes the reader from the newborn to the adolescent. Challenging many of our accepted truths, his book will encourage parents to think differently about children, and by doing so to feel more relaxed about their own parenting skills. David F. Lancy takes the reader on a journey across the globe to show how children are raised differently in different cultures. Intriguing, and sometimes shocking, his discoveries demonstrate that our ideas about children are recent, untested, and often contrast starkly with those in other parts of the world. Lancy argues that we are, by historical standards, guilty of over-parenting, of micro-managing our children’s lives. As I read, I learned that parents aren’t necessarily equipped to be teachers, but they can practice thoughtful good behavior that their children will want to emulate. Children prefer to learn on their own initiative while parents are seen as role-models. Children who are able to participate freely becomes an important basis for learning. Children want to learn but become reluctant when it is forced upon them. Reading to children at an early age is important, and it’s even more important to allow children to pick their own reading material as they become independent readers. Family dinners are only enhanced through children’s narrative fluency and interactions with the family. Children’s responsibility comes about gradually often by the want to help out their care-givers through a community effort within the household. When we raise children to only be individuals, we are losing sight that we, as humans, need social skills and interactions to live successfully in the community. 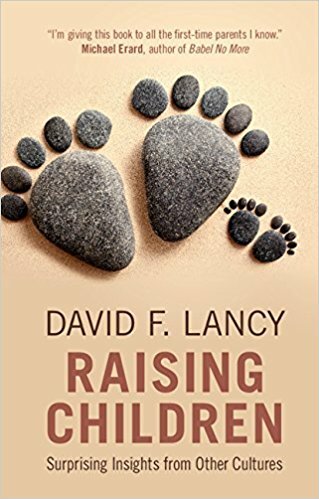 Whether or not you agree with Lancy, his studies on different cultures are fascinating and bring up many questions as to how we raise children in different cultures. Right or wrong, the way we parent affects the outcome of the child. Parental support means working with our child’s teachers, letting children love learning as they become independent in their studies, and model good social behavior and good will to others were my favorite subjects addressed in this book. That, in itself, was worth the read. About the Author: David F. Lancy is Emeritus Professor of Anthropology at Utah State University. He is author/editor of several books on childhood and culture, including Cross-Cultural Studies in Cognition and Mathematics (1983), Studying Children and Schools (2001), Playing on the Mother Ground: Cultural Routines for Children’s Learning (1996), The Anthropology of Learning in Childhood (2011) and The Anthropology of Childhood: Cherubs, Chattel, Changelings (Cambridge, 2015). About Cambridge University Press: Cambridge University Press dates from 1534 and is part of University of Cambridge. They further the University’s mission by disseminating knowledge in the pursuit of education, learning and research at the highest international levels of excellence. For more information, visit www.cambridge.org.